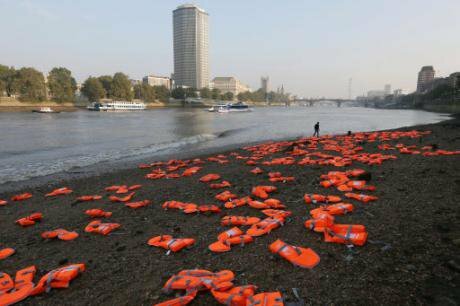 Installation organized by UK charities ActionAid and Islamic Relief to highlight the perilous journey across the Mediterranean undertaken by refugees fleeing war-torn countries. September 15,2016.Tim Ireland / Press Association. All rights reserved.On 19 September 2016, world leaders will congregate in New York at a United Nations Summit for Refugees and Migrants (hereinafter, UN Summit). Ongoing conflicts in Afghanistan, Iraq, South Sudan, Somalia and Syria, amongst others, have fuelled the mass movement of refugees. The acts of violence perpetrated by terrorist organizations have also accentuated the current flow of 25 million refugees worldwide. Responsibility for hosting refugees is disproportionately shared. Only particular countries host a greater majority of refugees worldwide such as Jordan, Lebanon and Turkey. This is corroborative of the fact that South-South refugee movements are more significant than South-North trends. The UN Summit is an opportunity not to be missed in highlighting the fact that refugees require international protection. In view of the upcoming UN Summit, the UN has been organizing consultations with government officials as well as members of civil society organizations and refugees themselves, to develop a declaration with two annexes including the Comprehensive Refugee Response Framework, to be adopted in September 2016. The declaration or draft outcome document contains certain useful guiding precepts such as the respect for human rights of refugees and adherence to international laws that cater for them. Key elements also refer to gender equality and the special needs of children. Importantly reference is made to non-discrimination of refugees and inclusion. A significant statement on ending statelessness is also included. Most importantly, equitable sharing of the responsibility is mooted. It is expected that the draft outcome, including a reaffirmation of the fundamental principles of international refugee law and global responsibility-sharing, will be a good cornerstone for the adoption by the UN General Assembly of the Global Compact on Responsibility-Sharing for Refugees in 2018 that is anchored to notions of self-reliance, support for host countries and above all a commitment to combat xenophobia. These statements and precepts are to be welcomed. That said, it is arguable that these draft declarations are bereft of novelty, ambition and a clear direction. The fact that refugees are still regarded as a ‘burden’ (diluting the socio-economic benefits refugees might bring) as reflected in some of these preparatory texts, is a cause for concern. As a rudder to guide multilateral efforts, and in view of the UN Summit, world leaders and other relevant stakeholders could benefit from five principles that are characterized by a clear sense of partnership and equitable sharing of responsibility, namely participation, accountability, coherence, transparency and solidarity (PACTS). Based on the assumption that responsibility sharing is a moral principle, participation in responsibility sharing demonstrates a commitment to the protection of refugees, which is a means to improve the effectiveness of any comprehensive refugee response. Participation could also be the insurance factor in sharing responsibility with others. Considering this background, the following elements are worth considering to ensure meaningful participation. First, it is of critical importance for leaders to consider how regional formations can be used as players and layers in negotiating collective actions for refugee protection by learning from experiences in the European Union (EU) and the past experiences of regional approaches such as the Comprehensive Plan of Action for Indo-Chinese refugees; which still has continuing relevance for the current crisis, when responding to massive movements of refugees. Needless to say, each state’s commitment should be appreciated in the given context as exemplified by Germany that assured its responsibility towards the current refugee crisis by suspending the Dublin procedure for Syrians. While the current responsibility sharing system tends to be state-centric, participation of a wider range of stakeholders, including non-state actors (in particular, civil society and private sector partners in responsibility sharing) would also prove effective for comprehensive responses to massive movements of refugees. Moreover, meaningful participation would entail ways of better involving refugees themselves in shaping the system of responsibility sharing. The current approach of doing things ‘for’ refugees appears largely divorced from the direct engagement of refugees in shaping their future. Having a political consensus on their participation is the first step in shaping technical modalities for realizing this objective. Accountability requires an independent, external and impartial mechanism that assesses state compliance and considers appropriate actions for failures where necessary. This may not be so straightforward in an area where the matter concerns one state’s responsibility towards another state. Nonetheless, there are three aspects of accountability that we can focus on: standards, monitoring and enforcement. Standards – a pre-condition for accountability is the need to establish common standards in the form of principles and criteria by which state responsibility may be assessed. Therefore, steps to clearly define the principles of responsibility sharing and the allocation of refugee protection responsibilities between states are essential. For example, distribution criteria based on national gross domestic product (GDP), population size, territory size and mechanisms for financial transfer and physical dispersal. Monitoring – this would involve an evaluation of state compliance with the defined standards and responsibility allocation. It would be necessary to ascertain whether state commitments have been met and whether the responsibility sharing results are equitable in distribution. An independent monitoring body that reviews compliance data would be required. States could report to this body bi-annually. Non-governmental organizations (NGOs) may also be requested to submit findings in a manner akin to the practice with universal periodic reviews (UPRs) of the Human Rights Council. Enforcement – this is important to ensure that there is effective accountability. It would require enforcement mechanisms that are external and independent, and have the power to sanction breaches by states of their responsibility sharing commitments. There is difficulty here in the area of international refugee law generally due to the absence of a treaty monitoring body. Although complaints may be framed in human rights terms and brought before other tribunals, there needs to be a more effective way of holding states to account. One option could be to establish an administrative body in the form of a ‘Global Asylum Authority’ that can deal with state non-compliance. However, the extent to which the imposition of a penalty or sanctions will be effective will depend on many other factors such the political climate and international relations, as well as state commitment and ‘buy-in’ to the responsibility sharing regime generally. With regard to policies, national policies on refugees often influence the selection of host country for refugees. Baseline policy frameworks identifying the methods of determination of refugee status, temporary protection measures (including camps), a broad framework for resettlement and the human rights of refugees need to be developed with a sense of commonality of purpose in order to move towards a fair system. It is critical to ensure that policies geared at refugee protection are not at cross-purposes with policies in other areas including lax arms sales and human trafficking measures. Moreover, bilateral arrangements between states need to be in line with the broader international policy architecture, so as to not prejudice the rights of refugees in any way. The requirements of transparency are no less onerous but essential in an area often marked by the manipulation of populist sentiments. Paucity of objective facts in this area has often fed public anxiety or widespread misconception of this issue. Increased transparency is critical to a fair and sustainable refugee protection system. In improving transparency, it will be useful to first, have a Refugee Protection Index (RPI) to be administered by UNHCR for naming and shaming countries that fall short in meeting key indicators or determinants on qualification, reception and procedural standards for refugee protection. Through this initiative UNHCR could then develop a list of countries that are Refugee Protection Champions (RPCs). The RPI will serve as report card for an assessment of what states do rather than what the UNHCR is tasked with. Second, it is critical that citizens of both host and sending countries request better public discussions and debates on the negotiation and adoption of re-admission agreements. The recent arrangements between the EU and Turkey, as well as numerous ‘agreements’ between the EU and many developing states on re-admission, have not been sufficiently scrutinized through open public debates. One of the most pressing challenges when it comes to creating a more effective and principled refugee protection system relates to the allocation of refugees. Eighty per cent of the world’s refugees are hosted in developing countries. It is imperative that a system be agreed upon where the rest of the international community shares this responsibility equitably in the spirit of solidarity. Not all countries can or should respond to refugee crises in the same way. An equitable system is not necessarily one where all asylum seekers/refugees are proportionally hosted around the world. Instead, a country’s response can depend on where they hold a comparative advantage. A country that is in close geographic proximity to the source of a refugee crisis is likely to host more than a country that is thousands of miles removed, and this situation is not going to be mitigated completely even by generous resettlement offers. In such an event, countries that are not receiving large numbers of refugees can contribute financial or provide other types of assistance to ease the ‘pressure’ on the receiving countries. In addition, a proactive approach – one that tries to prevent displacement, persecution, abuses of human rights, and humanitarian disasters – should be sought whenever possible. In this regard, leaders could also encourage the creation of a voluntary quota system to receive refugees inspired by the European model. UNHCR could support states in developing resettlement targets based on criteria such as their population, GDP, employment rate, and past acceptance levels. These objective criteria can help determine how many refugees a country can successfully absorb and integrate. Other factors, such as the existence of diaspora communities, or the degree of linguistic or cultural difference, may also play a major role in determining how many refugees are likely to be successfully integrated. If such a system were implemented, countries that are unwilling to meet their quotas or countries that are unsuitable hosts due to inadequate human rights protections should be encouraged to consider contributing in other ways, including financial contributions to host countries. As always, the main obstacle is enforcement. It is important that efforts are made to deal with the reluctance of states to engage with responsibility sharing mechanisms. It is equally critical that states, which are not inclined to accept refugees – or that are undesirable destinations for other reasons – are encouraged to bear some of the responsibility. These considerations underscore the importance of a future refugee regime that is anchored on solidarity. The world is at a crossroads in terms of refugee protection. The UN Summit provides a rare opportunity to engineer a system that is equitable both for refugees and for host countries. Such a system must have partnership as its leitmotif. We strongly believe that such partnership can be fuelled through greater levels of participation, accountability, coherence, transparency and solidarity. The authors are grateful for the insights from Professor Colin Harvey of Queen’s University Belfast.